Having been charmed by the audible longing of Smiley Lewis in his recording debut on the flip-side of this, a performance that seems to encompass the entire saga of a career that, while excellent, never fully came to fruition in terms of rewards, we’re offered a less introspective look at the same character on the other side which makes for an interesting contrast if nothing else. Right off we’re forced to confront the truth here – this is essentially the same song as Here Comes Smiley, refitted with different lyrics and given a slight dose of added vocal urgency maybe, but otherwise they pretty much are mirror images. The label credits suggested they were written by the same person, a white bartender in the city by the name of Leo Franks, who perhaps didn’t know music enough to vary the melodies but at least had a gift for evocative wordplay (either that or they were “given” to Franks as some sort of payoff by whomever really wrote them, be it Lewis or one of his cohorts). Here the touching lament of the reverse side gets coupled with a racier after hours tale here that’s equally effective lyrically and almost certainly had more commercial potential in the jukebox trade that Lewis, like all early rock acts, would have to conquer to make a name for himself. Which “version” you prefer probably has more to do with what persona you want to see the narrator project. With Turn On Your Volume, Baby Smiley is more boastful, confident and authoritative and surely that side of him has broad appeal. It also seems to have a foot in reality as well, for according to those who knew him Lewis could be a bit egotistical and full of himself at times. In fact that’s what led to the eventual breakup of his band as pianist Tuts Washington, who again all but steals the show here with his dexterous playing, was repeatedly challenged by Lewis for supremacy while on the road and finally had enough, leaving him after their first successes in the early 50’s. Considering that some form of swaggering cockiness seems to almost be a prerequisite for rock stardom, perhaps it’s fitting that Lewis embodied that attitude right off the bat on record as well. So if this is the version of Smiley Lewis that captures your fancy you surely wouldn’t be alone. But it doesn’t quite capture mine. At least not in comparison to the more wistful Smiley we met previously. Now that doesn’t mean this is without its own merits. The lyrics for one are a step above many records of the time, using the radio as a euphemism for more shapely pursuits without pushing too far into off-color territory, which may come as a disappointment to many who feel the racier the subject matter the better. But it doesn’t take much to envision what he’s really describing when he urges a girl to change her station and says “now your speaker’s buzzin’, but your output is too low“. His “tuning suggestions” appear to have had the desired effect as later he compliments her on the fact her “tubes are getting hot” and if anyone reading this reaches for a radio manual to interpret the lyrics at this point all I can say is that an actual radio is probably the only way you’ll ever hear a female voice in your ear. Unlike the (originally released*) version of other side we’re also treated to more than just Washington’s piano playing, as we get a concise, but effective, guitar solo by Smiley in the second break. Again, much like the flip, for years all of this was plagued by somewhat primitive recording equipment, nothing sounding really sharp as Lewis’s voice seems to be floating in the mist somewhere and it’s only his strong foghorn pipes and clear enunciation that assures you’ll be able to catch each word. Since the lyrics were the strongest aspect of the record it certainly helps to be able to hear them. (Note: In the winter of 2016 Ace Records of Great Britain released a collection of the DeLuxe label’s rock output from this era, all taken directly from the original acetates, which means we can finally hear this music in startling fidelity for its age. Included are the two Lewis sides we’ve covered here – * = the first in unedited form which allows us to hear Smiley’s guitar break on it for the first time – plus the other two songs he cut at the same session, “Love Is Like A Gamble” and “Swimming Blues”, which went unreleased at the time and were long only rumored to exist until the aforementioned CD, entitled Beef Ball Baby, remedied that. Click on the album cover below, or the underlined link of the album title just mentioned in green to buy this truly remarkable collection from Amazon – as you can for all of the similar links in reviews throughout the site for other recommended albums related to the subjects we’re covering – which will also enable the site to get a commission to help pay for the cocktails and hor d’oeuvres served here. Someone has to benefit from this after all, as little good the belated release did for poor Smiley who’d been dead since 1966. Now back to the regularly scheduled programing, already in progress). 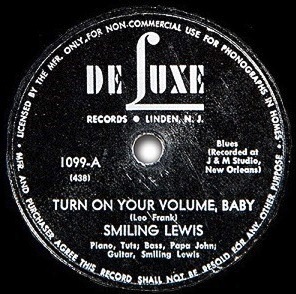 In any event, both sides of this record show that Lewis was a skilled singer capable of conveying different moods with a very unique but appealing voice. Washington meanwhile was simply one of the best pianists rock would ever know, a man whose reputation remained strong despite going literally decades without appearing on record after he quit Lewis’s outfit. Their interplay here is deftly executed, with Tuts darting in and out of the vocal lines, never overstepping yet even managing the hit individual keys more emphatically when he knows there’s the slightest pause in Lewis’s delivery coming. His instincts in that regard are uncanny. In a city known for its pianists there’s little doubt as to why Tuts Washington was held in the highest regard by everyone out of New Orleans who followed his lead and it’s a joy to hear him in his prime, even as simply a sideman. As well as it’s played though the content of the song probably calls for a little more raunchiness by all involved to emphasize the lyrical turn of phrases that are its main feature. Something to drive the point home a little more emphatically. Without that the song becomes more like a slightly detached fantasy rather than a salacious real-life event. Still effective at what it does maybe, but it just requires a bit more imagination on the listener’s part to have it fully connect. On the whole however based on these fairly strong first steps it would’ve seemed that Lewis was well positioned heading forward to be a major factor in rock’s evolution… which is why the resulting two year impasse he endured was so unfortunate and set a troubling precedent for his career, as he never seemed to be able to immediately capitalize on any break he received along the way. DeLuxe Records was a small independent label fighting the typical battles of the time to get their records distributed and paid for and within months its owners, the Braun brothers (David and Jules), would be forced to sell a 51% controlling interest in the company to King Records in an attempt to stave off their financial miseries, but which led almost immediately to legal wrangling that soon cost them the company they’d founded. Yet during their brief time on the scene they had already done what so many others failed to do – namely carve out a very distinct niche for themselves as the primary purveyors of not just this new fangled musical style, but also as the home to the best New Orleans had to offer, as an honor roll of major figures from this scene got their start with DeLuxe, among them Roy Brown, Dave Bartholomew, Chubby Newsom, Paul Gayten and Annie Laurie, along with Smiley Lewis. When King Record’s Syd Nathan took over DeLuxe entirely in 1948 the Brauns subsequently started up Regal Records and Gayten, Laurie and Newsom went with them. Brown and Bartholomew remained with DeLuxe while Lewis was simply let go, his other record, already given a catalog number no less (DeLuxe 3018), never got released. It’d be two years before he recorded again and then for another label altogether, Imperial, which swooped in to the void created by DeLuxe’s ownership turnover and subsequent abandonment of New Orleans, to claim that city’s immense talent for itself. During that time it had to pain Smiley to see so many New Orleans artists at the forefront of the emerging style, putting it on the map as well as on the charts while he continued to languish in relative obscurity, playing bars and picking up whatever money he could singing while at the same time forced, in the words of his then-wife, to “hustle” for a living by shoeing horses, moving furniture and doing other nondescript odd jobs to put food on the table. How many artists, especially at that time and in similar circumstances, saw their chance at making something of themselves with music slip away? How many of the men working on the Mississippi River in the late 40’s, as Lewis did to make ends meet when singing opportunities were few, had what it took to be professional singers, make engaging records and put on shows that drew the people in, only they never got that break, or, like Smiley, missed hitting it big when they got a crack at the big time? Realistically would there be a second chance for many of them? For Smiley Lewis there would be, but when that time came at last it must have seemed to some onlookers that Lewis was merely jumping on the New Orleans rock bandwagon after it left the station, but those who’d been paying attention all along knew he’d been on board from the very start, only this time it wasn’t that he was afraid to jump off it was more like he was pushed off before it reached its first stop and it’d simply take him awhile to catch up on foot. Leave a reply on "Smiley Lewis: “Turn On Your Volume, Baby”"